Although the Reids at Wildhaven have had a number of visitors wishing them well, after thirty-one days since the fires on February 7, they would very much appreciate a visit from Telstra to reconnect the land-line and they desperately need an electrician to come and inspect their telegraph poles and certify that the electricity may be reconnected. I have lots of film of my own recording a visit on March 10 to Wildhaven, but I was glad of this photo I was sent of Bob Irwin with Allan and Stella Reid. It was taken when he visited them at the devastated Wildhaven site yesterday (March 11, 2009). 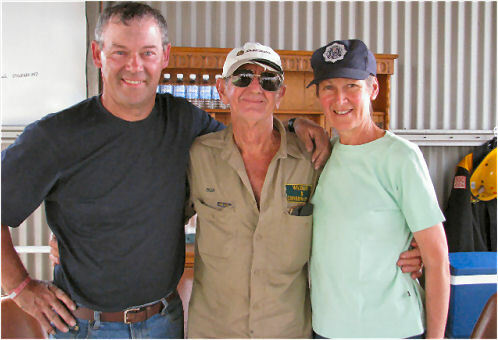 Bob Irwin's visit probably means a lot to the Reids because it shows that their serious and significant work supporting wildlife has been recognised by people respected world-wide in the hands-on wildlife-help and species-preservation community. Ironically so, since I also know that the Reids were quite hurt recently to be passed over for a small amount of funding by the Victorian Department of Sustainability (DSE), apparently with a remark that the applicant 'lacked experience'. Do DSE realise how much damage their lumpen conduct towards wildlife and so-called 'Greenies' does? I am probably not the only one who thinks that that remark reflects pretty accurately where the DSE is at. Stella and Allan have been running their wildlife shelter for 22 years. DSE could learn from them - that is, if it could first master its arrogance. The Reids built Wildhaven 11 years ago and must have wondered what hit them when the ignorant knockback came. It is worthwhile noting that the DSE insult still comes to the Reids' minds, even after having Wildhaven totally wiped out by the Black Saturday fires, and almost being wiped out themselves. Both of them weep every time that they mention the animals that died - "the kids" - as they refer to them affectionately, although the rest of the time they put on a brave face. Something like sixty-plus injured wildlife they were treating or in the process of releasing, of which each one was an individual with which they had a close relationship, will probably never be seen again. The dam below was full of the bodies of animals for whom the water did not prove sufficient shield against this super-hot fire. The CFA and the police helped the Reids to collect tens of dead animals and then took them away. Between three and five kangaroos they knew probably survived. Alan wonders if they crawled into wombat holes. A doe, her joey and her adult daughter (known by names I cannot recall) came back to Wildhaven with burned paws. They were darted with anaesthetic so that the Reids could send them for treatment to a wildlife-rescue place that hadn't been burned out. They have all recovered, but, worryingly, the doe jumped the fence of the wildlife-hospital with her joey and has not been seen since. 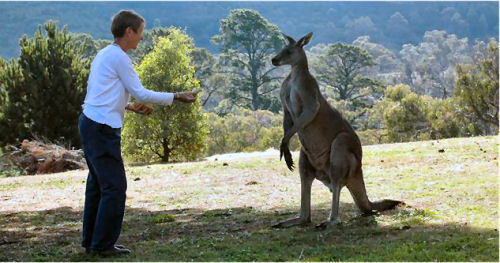 The Reids also hope that the big male kangaroo with mending burned paws, who has been eating hay on the outskirts of the camp, is who they think he is - "Boof" - pictured below in happier times, with Stella. Grass is starting to grow back, but it is very short and still brown, because there still has been little rain. There is absolutely nothing for animals to graze on. Even the micro-biota in the earth (representing a lot of carbon) were burned and the top layers are sterile. Stella and Alan are buying bales of hay (at about $17.50AUD each) and putting them out for the animals that survived. The Department of "Sustainability" does absolutely nothing for these animals, on pseudo-scientific macho grounds. Since its main job is to grant licences to shoot and 'harvest' our pitifully sparse wildlife, it is not surprising that its policy is to let them die, even though a million or more of Victoria's animals died in these fires, many from threatened species. The Reids walk into the burnt stick-like trees at dawn and at dusk, looking for old friends who may have survived and for any animal they may be able to help. The Reids deserve the salaries currently going to DSE CEOs. They survive on handouts at the moment. Don't get me wrong - they are not complaining - I am. Stella's wildlife photos are much admired because she can get so close to the subjects and the animals look her back in the eye affectionately or with recognition and readable, respectful expressions. She lost thousands of such extraordinary animal photos in the fires, but almost immediately she was able to get her hands on a computer, she put together a CD of the photos she had received back from correspondents over the years. There is so little left now of the youngsters and adults she knew and loved so dearly. She takes us later into the caravan they are living in now to watch it and tells us the names of the animals in the pictures. It is very sad. I brought some warm jumpers (because we are entering autumn) and a doona. Alan said they don't need clothing but Stella accepted these and said she will put the doona in the back of the ute for when she transports animals, to make a soft bed. It is good that my doona will be appreciated. Mostly they need money to buy food and treatment for animal survivors for the next few months to two years. The temporary camp they are living in on the burned site is made up of a caravan, a temporary showroom and a porta-potty which have been lent to them. As I approached the camp I was struck by the surreality of this view, and I started taking stills. The portable showroom which was lent as shelter to the Reids, looked like a tiny stage-set in a vast empty landscape and the people preparing afternoon tea there looked like dolls in a dolls' house. Stella and Alan had stayed up half the night painting the concrete block in front green, so it looked like a pretend-lawn before a very neat dolls' house, set down by some giant careful child in a vast neglected yard. I set the tripod up again with the digital camcorder running and when I look the film later that night, it is like watching people walking on and off-stage and hearing them talking. I almost find myself listening for clues to some other scripted drama. It was hard to tell whether it was a strain or a pleasure to receive visitors. Stella had bought a mobile phone to alleviate the isolation. We had come with a visitor from England who is interested in kangaroo-rescues and the Reids have transformed this open temporary building into something like a pleasant lounge and dining-room. We felt very welcome and at home, and probably that's the way they make the wildlife feel. Stella has been a member of the Country Fire Authority (CFA) for about 9 years and she had been with Steve Martin (the blond man in the beige top pictured above) fighting a fire on a distant ridge while Alan, her husband, was at home with the animals. She had looked across when there was a sudden burst of fire from that direction, wondering if it was Wildhaven. Others thought that it probably wasn't. But it was. Alan saw the fire coming from the hill where, unbeknowst to him, his wife was, and thought he had about 20 minutes. He says he found out he had only seven minutes. I am putting a video up with his story and footage of Wildhaven at http://www.youtube.com/watch?v=Td6tWKDC62s for anyone who is interested. We all hope that Wildhaven will soon be back in working order. When that happens the future will take over from this terrible past and slowly the scars will heal. They must be very deep and painful scars though, after 11 years in this place, with a past composed of very close connections with the secret lives of thousands of individual creatures, animals that most humans don't even notice, let alone care about. Indeed the Reids have spent 22 years in this region doing this work, all told. Animals one lives close to are almost a part of one. My dog Nero died after 16 years recently and it was like a door slamming shut on the past and a familiar star disappearing from the sky. Although his elderly sister is still alive, my life seemed to make no sense for months. Even now it doesn't feel right. How difficult it must be then to see an entire galaxy disappear and the ground change irrevocably underneath your feet.